THYOLO-(MaraviPost)-Front-runner in next month’s tripartite elections, the UTM, says its administration will stimulate land reforms in the southern region where many Malawians are turning into tenants on their own land. 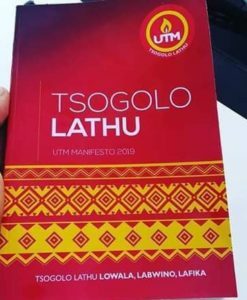 UTM president Dr Saulos Chilima made the pledge yesterday during a mass rally at Bvumbwe in Thyolo district where ordinary locals have been at constant loggerheads with huge tea estate owners over the issue of land. According to Chilima, land is a very important aspect in the UTM’s agenda to transform the country’s agriculture. “People of Bvumbwe and many other parts of the southern region are very hard working farmers. However, for some time now their potential has considerably declined basically because there is no land for them to work on. 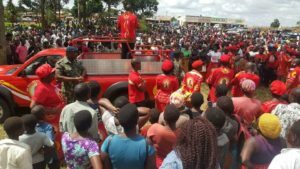 When we get your mandate on May 21 we will effect reforms to free up land for local Malawians,” Chilima said to loud cheers from the crowd. According to Chilima, the UTM’s agriculture revitalisation drive will also include capacitating extension workers, implementing a universal fertiliser subsidy programme with prices pegged at less that MK10,000 and providing ready markets for farmers to sell their produce. “A vibrant agriculture structure is critical for us to fulfil our flagship promises of three meals a day for all, one-million jobs in the first 12 months and a renaissance in the agri-industry where raw materials will be processed and quality products manufactured for our people,” the UTM leader told the rally. On social amenities, Chilima reiterated his pledge to abolish connection fees for portable piped water and electricity saying no Malawian should be denied their right to these important services as long as they have capacity to pay the bills for maintenance. “I want to assure you that a better, transformed Malawi is very possible. All we need to do is to end corruption through a truly zero-tolerance approach. When we do that then we will be able to provide good health facilities with available drugs, build good markets and schools and ensure that our public workers are well paid and taken care of,” he said. Chilima, whose political approach continues to captivate many prospective voters, ended his remarks by condemning suspected governing DPP cadets for continuing to threaten chiefs against attending his rallies saying such behaviour is outdated and retrogressive. Speaking earlier, UTM NEC member and shadow MP for the area, Anita Kalinde, listed several issues that she asked Chilima to address when he assumes the presidency next month. Kalinde said people of Bvumbwe would like to see their old market place extended, get access to clean and safe portable water, assurance of drug availability at the health centre which she said needs to be upgraded to a community hospital, a reduction in farm input prices and a boost in business opportunities for the youth.